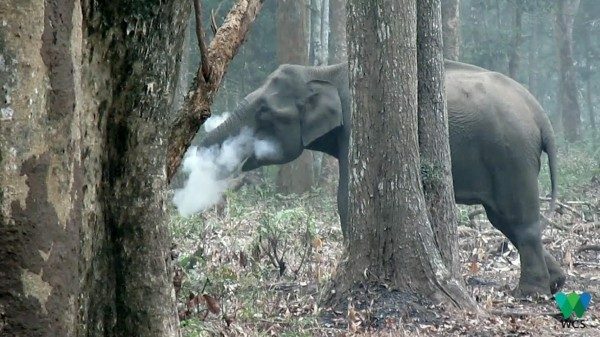 A ‘smoking’ wild elephant captured in-camera, is not only puzzling but raised curiosity amongst scientists and experts further to study the unusual behaviour by the pachyderm. The Wildlife Conservation Society, India Program, has shared what it claimed as the first ever video of ‘smoking’ wild elephant captured in Karnataka forests and its observations, as the elephant supposedly ingests charcoal and blows out ashes. It has baffled experts worldwide. The ‘smoking’ Asian wild elephant was captured in camera by WCS Assistant Director Vinay Kumar in Nagarhole National Park in Karnataka. The WCS shared the unique video-documentation with this author today that although, was captured by one of its official about a year ago, providing new insights into wild elephant behaviour. Vinay Kumar, Assistant Director captured the video of the wild Asian elephant seemingly ‘smoking’, as it appears to ingest charcoal and blows out the ashes. The video was taken in Nagarahole National Park in Karnataka in April last year when its team, comprising of Vinay himself, his colleague Srikanth Rao and three field staff involved in a project undertaking long term monitoring of tiger and prey populations, the WCS said. WCS India Program, based in Bengaluru, has combined cutting-edge research on tigers and other wildlife, with national capacity building and, effective site-based conservation through constructive collaborations with governmental and non-governmental partners. WCS India Program is committed to saving wildlife and wild lands, nurturing and inspiring positive attitudes towards nature in people through its scientific and conservation endeavors. WCS claimed that this is the first known video-documentation of a wild elephant exhibiting such behaviour, and thus has scientists and experts puzzled. Dr.Varun R. Goswami, elephant biologist and senior scientist with WCS India Program believes that, most probably, the elephant was trying to ingest wood charcoal, as she appeared to be picking up something from the burnt forest floor, blowing away the ash that came along with it in her trunk, and consuming the rest. Charcoal has well recognised toxin-binding properties, and although it may not have much nutritional content, wild animals may be attracted to it for this medicinal value. Charcoal can also serve as a laxative, thereby doubling its utility for animals that consume it after forest fires, lightning strikes, or controlled burns.